One of my big problems is that I feel no desire to drive around the United States, bouncing between towns and races as I did in the original. 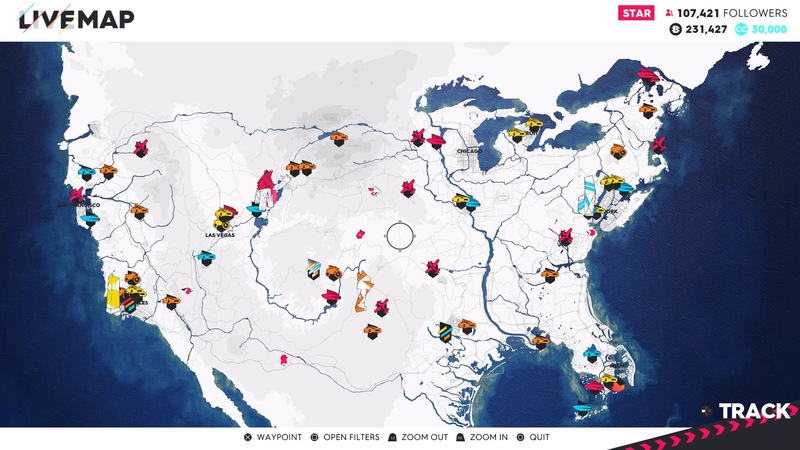 The whole structure of the first game has been ripped up and thrown away, leaving us with something that comes across as a half-baked attempt at creating Ubisoft’s own Forza Horizon. There is no overriding story (however corny it had been first time) to bounce you between cities, nor do the hubs offer any incentive to drive back to. The aim of the game is to earn followers, primarily by completing races, but also occasional activities such as powering through speed traps, or meeting some very specific photography criteria. Once you reach a new level of fame, a special event is unlocked combining three of the multitudinous number of disciplines on offer. These big set piece races are the highlight of the game as you seamless switch between different cars, or the boats and planes on offer. But sadly, there’s only a handful of these big events, leaving me wanting more, bigger, wilder special races. The core of the game is based on events coming from the four event themes: Street; Off Road; Freestyle and Pro Racing. Each theme has a number of discreet disciplines within it. For example, Street involves street racing, drift, drag races and hyper car events, with each discipline being unlocked as you hit different fame levels. The trouble is, the number of events within the disciplines aren’t equally balanced, and you will find many more street racing events than rally raid or powerboat races. It all means that to grind out the new fans to increase your fame, you will find yourself completing endless street races, especially if some of the more quirky discplines like drag races or jet sprint, don’t take your fancy. Street races are fine and dandy really, they’re inoffensive, short and sweet, and have eye catching yellow directional signs to point you in the right direction. It’s a shame that navigation when not racing, or on long distance events that come in the hyper car discipline, is frankly appalling. The GPS mini-map isn’t up to scratch; at least, not for me. I’ve written about my colourblindness in the past, and with The Crew 2 it seriously hampers my enjoyment of the game. On the GPS, streets are white while the best route to take is in an extremely light blue or pink. I can’t tell what the colour is, as I can barely differentiate it from the normal streets. It makes free driving a hassle, while on the longer races which don’t have the helpful yellow directional signs, I’ve lost a race twice in the final thirty seconds of a twenty minute cross-country adventure because I can’t tell which road takes me to the finish, and which takes me in the wrong direction. It’s a massive shame, as these long races are a highlight of The Crew 2, and were my favourite part of the first game. Finishing them in last position because I can’t dinstinguish the correct route is galling. I’m also left saddened that there are so few of these wonderful adventures. 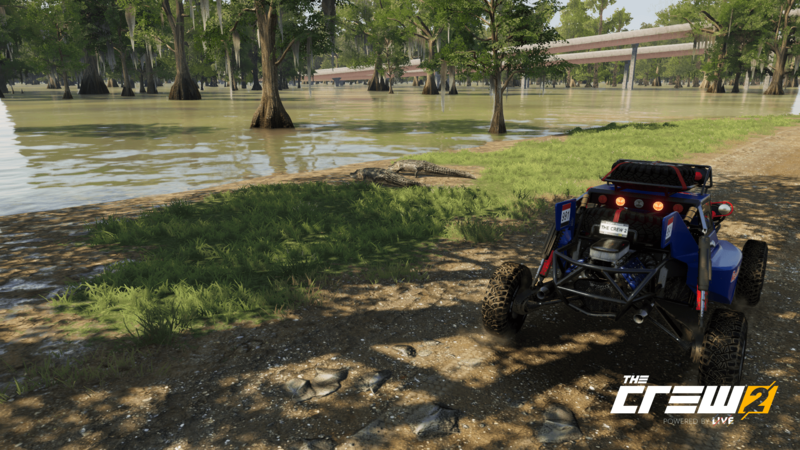 I’ve spent the majority of time taking part in rally raids as they offer a great mix of off-road action, a sense of exploration, while also having suitable signage to know where your next destination is. But overall, there just aren’t enough of the types of races that I am enjoying in The Crew 2. I should take a moment to highlight the big new features, namely flying and boating. Each has two disciplines; aerobatics and air races alongside powerboat racing and the awkward jet sprints. Powerboat racing is exhilerating, developers Ivory Tower have done an amazing job with these races which require a different type of driving skill to what you might think. Following another boat won’t give you a slipstream, following their wake will unsettle your boat losing your top speed. Sending your boat flying over strategically placed obstacles, and watching it land with a wonderful splash is great fun. But again, there aren’t enough of these races for my taste, and there aren’t enough incentives to sail around when outside the races. It’s a strange thing to say, as when zoomed out, the world map is absolutely cluttered with icons indicating events or small activities to complete. But being out on the road…it doesn’t fill me with the joy that it did in the original game. The makeup of the vehicles available for purchase is an odd one. The vehicle list is heavily tilted towards American manufacturers, while there are seemingly a dozen different types of Ford Fiesta to buy, each one designed for individual disciplines. It means you can end up with a garage full of cars, but some you will only be able to use in four events, and are so unwieldy, you wouldn’t ever want to take them out on the road when not racing. The situation with the vehicles comes down to one of the core parts of The Crew franchise. Namely, each vehcile can be generically upgraded with the loot dropped at the end of a race; and each car within a set category has the same maximum performance level. There’s little incentive to fill your garage with fancy cars, when you can take the cheapest one and bring its performance level in line with the most expensive car in the category. I appreciate Ivory Tower’s efforts to balance the game, and make it friendly to newcomers. But all in all, it feels like another example of a game where too much is being thrown in, without considering what mix of content is required to create a balanced game. There’s a solid game under the surface, and I know Ivory Tower and Ubisoft will continue working on, and improving this open-world racer. It isn’t bad game, and I know that some people will get much more out of it than I have. It depends on what kind of events rock your boat (no pun intended), but it is safe to say, the current mixture doesn’t give me enough of what I want, but what there is, gets my excitement levels ramping up. Review based on copy supplied by Ubisoft. For more on our review policy read this post.